Do you have periods during the year when sales naturally are naturally low? Are you looking for ways to increase sales during those times, but without offering discounts? In this case study, we’ll learn how Nashville Pedal Tavern added thousands of dollars of revenue selling gift certificates during their slowest time of year, and without losing money by offering coupons. Nashville Pedal Tavern is a party bike company that was recently voted the #1 Outdoor Attraction in Nashville. Over the course of a two-hour tour, 15 guests collectively pedal their way to several local bars and attractions. The marketing agency TOMIS helps fun-loving tourism businesses like Nashville Pedal Tavern capture and convert leads. Amanda Rouse from TOMIS talked with us about the success they’ve seen using OptinMonster on the Nashville Pedal Tavern website. The Pedal Tavern was looking for a way to boost sales during the slow season around the Christmas holidays, but without offering a discount or coupon. They decided selling gift certificates would be a great place to start, encouraging guests to buy someone else a ride on the Pedal Tavern. To do this, they used a lightbox optin set to display on any page of the website. The optin only triggered once the visitor had been on the site for at least 30 seconds. They used our Yes/No feature to display two buttons rather than an optin form. Our Yes/No feature allows you to display buttons in your optins instead of a form. Each button can redirect to another URL, display an optin form, or simply close the optin. The Yes button for this optin read, “Yes, I am an awesome gift-giver!” and redirected to a landing page selling their gift certificates. The No button said, “No, I prefer to regift old candles.” and simply closed the optin. Amanda had a piece of advice for others considering using the Yes/No feature. Use humor in your copy and be creative with your visual design. If you want people to react positively to being subjected to an optin, incorporate a visually appealing or funny style to gain a reaction and hopefully, a lead. In just 14 days, this optin resulted in 247 leads and 10 conversions, worth $2,300 in sales. 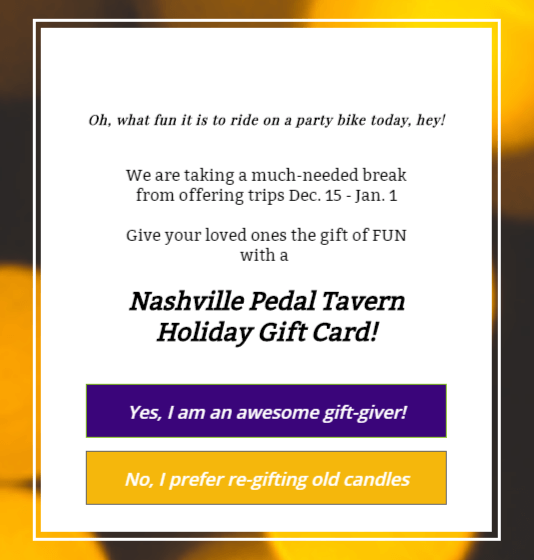 The Nashville Pedal Tavern used OptinMonster to begin selling gift certificates during a normally slow sales period, even without offering discounts or coupons. Nashville Pedal Tavern used a lightbox optin to add 247 leads to their email list. Nashville Pedal Tavern converted 3.36% of those leads into gift certificate sales. Nashville Pedal Tavern added $2,300 in revenue as a result of using the gift card lightbox. OptinMonster can help you uncover thousands of dollars of revenue, just like it did for Nashville Pedal Tavern. Examine the hidden opportunities in your existing sales cycles, then use an optin to present those to your visitors. Selling gift certificates, referrals, cross-sells and upsells are just a few of the ways you can generate more cash without compromising your bottom line. OptinMonster has played a pivotal role in converting our client’s website visitors into engaged leads and paying customers. That means even a small increase in subscribers creates a direct and noticeable impact to the overall growth of our client’s businesses.